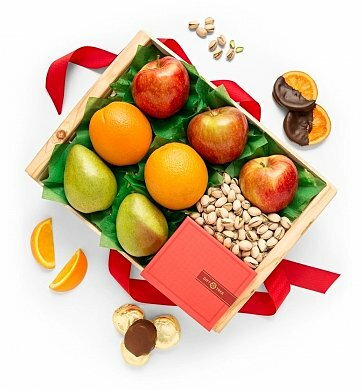 Handpicked oranges, crisp apples and juicy pears meet fresh nuts and chocolate fruit in our signature crate. It's a gift of health and indulgence. Premium grade apples, oranges and pears. Fresh pistachios, chocolate-dipped fruit and more. Each gourmet item is carefully arranged in our signature gift crate. A free card is included with your personal message or greeting, as well as complimentary scissors so your recipient can easily open their gift. Your gift will leave a lasting impression as they continue to enjoy this rustic crate with fitted sliding lid. Measures 14" x 11 x 4". Harvest Grove Nuts and Fruit Crate is a hand delivered gift. These gifts are delivered by one of our local design centers located throughout the United States and Canada. Same day delivery is available for most gifts when ordered before the cutoff time. The cutoff time for Harvest Grove Nuts and Fruit Crate is in the recipient's time zone. Double-Dipped Chocolate ApricotsPlump, sweet apricots are dipped in creamy milk and dark chocolate for an indulgent treat. A generous gift of freshness in our signature crate.